Beth may not be as Internet-geeky as some of us, but she certainly is a geek, she is actively involved in plenty of social networks, and she does blog. So she made the cut for our series! Social Networks: Jaiku, Pownce, Facebook, Flickr, Friend Feed, identi.ca, Last.fm, MyBlogLog, Technorati, Twitter. I'm also a member of the Luxuriant Flowing Hair Club for Scientists: http://improbable.com/2007/07/13/beth-snow-joins-lfhcfs/ and the Order of the Science Scouts of Exemplary Repute and Above Average Physique. Current Employment: I run a research training program in gender & addictions and I teach nutritional sciences courses at the University of British Columbia; I also teach science to elementary school kids as a "Scientist in Residence". I mainly write things that I find entertaining and, somewhat surprisingly to me, others seem to find what I write entertaining as well. So now my motivation is writing to entertain & build community, as well as because I just like to write. Oh yes, and to win friends and influence people. As my blog is a personal blog, that topics that I write about vary in that I write about whatever happens to interest me at any given time. But I do seem to have some themes, including hockey (I am Canadian, after all), science, occasionally politics, funny things I find on the Internet, rants, feminism, and shoes. I blog regularly (about once a day), sometimes short, sometimes long. My blog postings are predominantly text, but I occasional embed videos from Youtube, etc. I haven't yet ventured into the realm of videoblogging or audio, but I've thought about it. I've been a geek as far back as I can remember; I've always enjoyed science and grew up knowing that I'd be a scientist. I've also been a girl for as far back as I can remember ;-) So how did I become a blogger? Well, I started blogging as procrastination, but a form of procrastination that felt more productive than your run-of-the-mill procrastination, since, in the end, I had a bunch of writing sitting up on the Internet when I blogged. I was writing my doctoral dissertation at the time, but it was a lot more fun to blog than it was to work on that dissertation! 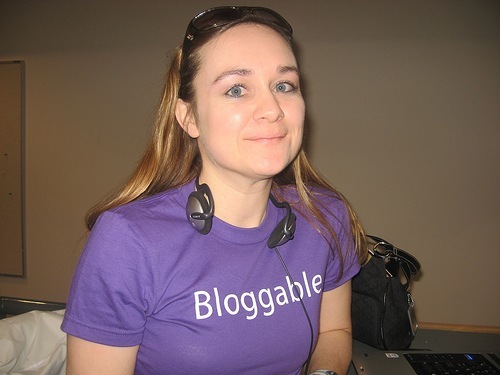 Eventually I somehow completed my doctorate, but by that time I was hooked on blogging! who doesn't love to blog. I love to blog, you get to find out so much stuff and get to know others. Its great.